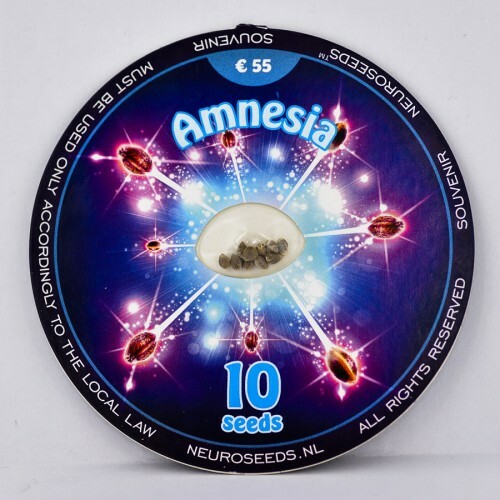 Thanks to the neurobiologists and geneticists, Neuro Seeds has developed entirely new variety called Amnesia, which can be grown both in greenhouses and outdoors, but this variety is suitable only for warm climates. It can produce above 70-80 g per plant in greenhouse conditions and 200 g per plant when grown in the open air. Blooming period is about 12 weeks. Amnesia is very beautiful variety with small popcorn-shaped inflorescences and smell of black pepper with nice woody notes.For those who use marijuana for medical purposes, Amnesia is a perfect choice. Neuro Seeds geneticists have conducted studies to take care of balanced composition of Indica (20%) and Sativa (80%). Patients who use medical marijuana experience therapeutic effect during two hours. Due to the extremely high content of CBD, this strain quickly relieves you from such symptoms as headaches, insomnia, body pain, stress, anxiety. It can help you with attention deficit hyperactivity disorder, absence of appetite and asthma.